Abstract. I propose that phylogeny took place in a manner similar to that of ontogeny by the derepression of preformed genomic information which was expressed through release from latency (derepression) by the restructuring of existing chromosomal information (position effects). Both indirect and direct evidence is presented in support of the Prescribed Evolutionary Hypothesis. Historically there have been two major hypotheses to explain organic change, that of Lamarck, based on the transmission of characters acquired during the life of the individual and that of Darwin, which placed Nature in the role of selecting and thereby preserving those genetic changes which proved to be of advantage to the organism. These changes were presumed to be the means by which evolution proceeded. Each of these hypotheses has been thoroughly tested. The Lamarckian hypothesis was tested by August Weismann in DarwinÃ¢â‚¬â„¢s own day with negative results. The Darwinian hypothesis has been tested with limited success. There is no question that artificial selection can significantly alter the phenotype as demonstrated with dogs, goldfish, and a host of other domesticated forms, both plant and animal. Nevertheless, the products of the most intensive selection have not exceeded the species barrier. It seems that sexual reproduction is incapable of transforming species even to new members of the same genus. Even if this could be demonstrated, it seems very unlikely that such a process could ever produce the higher categories of genus, family, order or class. I realize that these are contentious matters and it is with some trepidation that I have abandoned each of these hypotheses in order to offer what seems to me the only real viable alternative. It is the responsibility of the scientist to expose failed hypotheses, but it is equally his responsibility to offer a replacement for them. That is the purpose of this paper. Some of what I will present is not new with me but was proposed long ago by those I will cite, in their own words, so there is no misunderstanding of what they meant. I propose that the information for organic evolution has somehow been predetermined in the evolving genome in a way comparable to the way in which the necessary information to produce a complete organism is contained within a single cell, the fertilized egg. Just as differentiation involves the ordered derepression of pre-existing information, so then I propose, did evolution proceed by a similar means. Viewed in this way, ontogeny and phylogeny become part of the same organic continuum utilizing similar mechanisms for their expression. For those who may be unfamiliar with the history of evolutionary thought, these notions may seem bizarre, but they are in no way original with me. I only propose to extend them somewhat further. Ã¢â‚¬ÂFinally, Bateson likewise (1914) inclines to the view that the entire process of evolution may be regarded as Ã¢â‚¬Ëœan unpacking of an original complex which contained within itself the whole range of diversity which living things presentÃ¢â‚¬â„¢.Ã¢â‚¬Â (Berg, page 359). Ã¢â‚¬Å“On the other hand, an unbiased examination of the fossil material itself also reveals that absolutely no direct response to environmental influences or appropriate adaptations in the Lamarckian sense must necessarily be inferred.Ã¢â‚¬Â (Schindewolf  page 312). Ã¢â‚¬Å“At most, the environment plays only a similar role with regard to organisms; it can only provoke and set in motion some potential that is already present.” (Schindewolf page 313, his emphasis). Ã¢â‚¬Å“Natural selection is a real factor in connection with mimicry, but its function is to conserve and render preponderant an already existent likeness, not to build up that likeness through the accumulation of small variations, as is so generally assumed.Ã¢â‚¬Â (Quoted in Berg, page 314, my emphasis). Ã¢â‚¬Å“In all the research since 1869 on the transformations observed in closely successive phyletic series no evidence whatever, to my knowledge has been brought forward by any paleontologist, either of the vertebrated or invertebrated animals, that the fit originates by selection from the fortuitous.Ã¢â‚¬Â (Quoted in Berg, page 127). It should also be noted that Schindewolf was adamant in his refusal to regard evolution as an experimental science. Ã¢â‚¬Å“Evolution, a unique, historical course of events that took place in the past, is not repeatable experimentally and cannot be investigated in that way.Ã¢â‚¬Â (Schindewolf, page 311). As an experimental biologist I was, at first, very reluctant to accept his judgment. In retrospect however, I am now inclined to believe he was correct. If true, it can offer an explanation for the failure of both Darwinism and Lamarckism to provide answers to the causes of evolution. One can hardly expect to demonstrate a mechanism that simply does not and did not exist. We are left with the provisional conclusion that evolution, like ontogeny, has been driven by internal mechanisms the nature of which remain, at present, unknown. A consideration of evolution as an emergent process suggests a completely new interpretation of certain phenomena. I recounted several examples in an earlier paper (Davison ) so I will only briefly refer to them again. The so-called phenomenon of convergent evolution may not be that at all, but simply the expression of the same preformed Ã¢â‚¬Å“blueprintsÃ¢â‚¬Â by unrelated organisms. Examples include marsupial Ã¢â‚¬Å“molesÃ¢â‚¬Â, Ã¢â‚¬Å“wolvesÃ¢â‚¬Â, Ã¢â‚¬Å“anteatersÃ¢â‚¬Â, Ã¢â‚¬Å“rabbitsÃ¢â‚¬Â (bandicoots), Ã¢â‚¬Å“squirrelsÃ¢â‚¬Â, including flying forms (phalangers), Ã¢â‚¬Å“woodchucksÃ¢â‚¬Â (wombat), Ã¢â‚¬ÂbearsÃ¢â‚¬Â, (koala), Ã¢â‚¬Å“miceÃ¢â‚¬Â (Coenolestes) and most remarkable of all, saber-toothed cats. 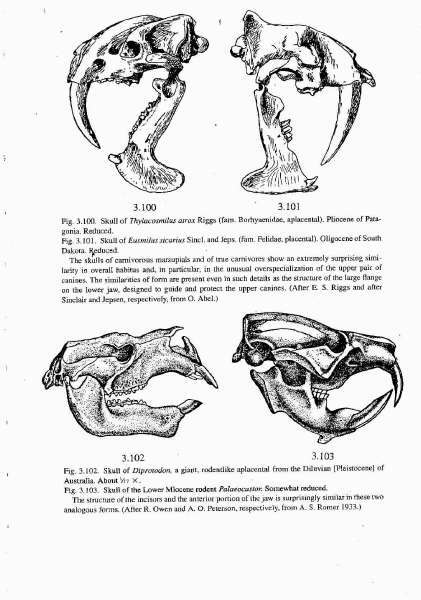 In Figure 1 Schindewolf presented pictures of the skulls of the marsupial Thylacosmilus atrox opposite that of the placental Eusmilus sicarius, the former from the Pleistocene of Patagonia, the latter from the Oligocene of South Dakota. The two forms are separated by thousands of miles spatially and millions of years temporally. SchindewolfÃ¢â‚¬â„¢s legend beneath the figure is of special significance as it bears, not only on the questions raised here, but also, on the whole issue of Intelligent Design with which those questions are clearly related. Ã¢â‚¬Å“The skulls of carnivorous marsupials and of true carnivores show an extremely surprising similarity in overall habitus and, in particular, in the unusual overspecialization of the upper pair of canines. The similarities of form are present even in such details as the structure of the large flange on the lower jaw, designed to guide and protect the upper canines.Ã¢â‚¬Â (Schindewolf, page 261, my emphasis). Schindewolf also illustrates examples from the plant kingdom of xerophytes from three different plant families all exhibiting the Ã¢â‚¬Å“cactusÃ¢â‚¬Â phenotype (Cereus Pringlei, Stapelia grandiflora and Euphorbia erosa). In that same plate he compares photographs of the marsupial wolf Thylacinus cynocephalus with the placental wolf Canis lupus. (Schindewolf, plate 5). Similarly, the placental gerbil (Gerbillus) mimics the kangaroo and wallaby both structurally and in mode of locomotion. It should also be obvious that if specific information was preformed in the evolving genome there would be no need for gradual transformations from one form to another, which remains in accord with the conspicuous absence of transitional intermediates in the fossil record. Furthermore, since such transitional forms are also absent in the contemporary biota, there seems to be no compelling reason to postulate their existence during their evolutionary emergence. In short, evolution may have proceeded by a series of instantaneous transformation (saltations) asindependently proposed by both Schindewolf , Goldschmidt  and more recently by the present author . Such a mechanism represents the very antithesis of the gradualist Darwinian paradigm. The Darwinian model would explain these phenomena as resulting from the gradual accumulation of mutations. Pierre Grasse commented on the Darwinian view as follows. Ã¢â‚¬Å“A cluster of facts makes it very plain that Mendelian, allelomorphic mutation plays no part in creative evolution. It is, as it were, a more or less pathological fluctuation in the genetic code. It is an accident on the Ã¢â‚¬Å“magnetic tapeÃ¢â‚¬Â on which the primary information for the species is recorded.Ã¢â‚¬Â (Grasse, page 243, my emphasis). One may note that I have used the past tense in reference to evolution. I earlier presented the evidence that macroevolution (true speciation and certainly the formation of the higher categories) is no longer in progress, again a conclusion reached by others long before me, notably Robert Broom. (Davison ). Ã¢â‚¬Å“The period of great fecundity is over; present evolution appears as a weakened process, declining or near its end. ArenÃ¢â‚¬â„¢t we witnessing the remains of an immense phenomenon close to extinction? ArenÃ¢â‚¬â„¢t the small variations which are being recorded everywhere the tail end, the last oscillations of the evolutionary movement? ArenÃ¢â‚¬â„¢t our plants, our animals lacking some mechanisms which were present in the early flora and fauna?” (Grasse page 71). Even Julian Huxley, the author of Evolution: the Modern Synthesis, suggested as much in a statement difficult to reconcile with the Darwinian model. Ã¢â‚¬Å“Evolution is thus seen as a series of blind alleys. Some are extremely short — those leading to new genera and species that either remain stable or become extinct. Others are longer Ã¢â‚¬â€œ the lines of adaptive isolation within a group such as a class or subclass. Which run for tens of millions of years before coming up against their terminal blank wall. Others are still longer Ã¢â‚¬â€œ the links that in the past led to the development of the major phyla and their highest representatives; their course is to be reckoned not in tens but in hundreds of millions of years. But all in the long run have terminated blindly.Ã¢â‚¬Â (Huxley  page 571). This remarkable summary appears just seven pages before the end of the book and would seem to challenge much of what has preceded it. Ã¢â‚¬Å“Rather, our analysis supports a nonrandom model of chromosomal evolution that implicates specific regions within the mammalian genome as having been predisposed to both recurrent small-scale duplication and large-scale evolutionary rearrangements.Ã¢â‚¬Â (Bailey, et al. , my emphasis). Recent studies (Bauer et al. ) show that genes experimentally introduced near chromosome ends (telomeres) tend to be silenced, this providing further evidence for Ã¢â‚¬Å“position effectsÃ¢â‚¬Â in determining gene expression. While these are developmental phenomena, might they not also have operated during evolution? The great genetic complexity of a primitive form such as Acropora millepora raises an interesting question concerning the nature of the evolutionary process. Is it not possible that evolution might have involved, to some extent at least, the loss rather than the gain of information? Comparing phylogeny with ontogeny once again, certainly the fertilized egg has a greater developmental potential than the individual cells which result from its division. Thus, just as differentiation results in a progressive loss of potential, so may have phylogeny proceeded in a similar fashion. This perspective also offers a rationale for the irreversibility of the evolutionary process. I hope that this brief discussion will serve to stimulate a further investigation into the mystery of organic evolution from a new perspective. The Prescribed Evolutionary Hypothesis (PEH) presents a clear alternative to both the Darwinian and Lamarckian paradigms. It is no longer acceptable to regard evolution as a self-regulating phenomenon guided by random mutation and Natural Selection, especially since it has failed the acid test of experimental verification. PEH is not even a particularly radical idea. Does anyone believe that the laws that are so evident in all of mathematics, physics and chemistry were not somehow prescribed? Science is nothing more than the discovery of that which is there and always has been there. It is interesting to note that Charles Darwin and Alfred Russel Wallace discovered nothing. They had both been profoundly influenced by the writings of Malthus and Lyell and erected their hypothesis largely on those considerations alone, namely extensive periods of time and overpopulation. It is of great significance and much to his credit that Wallace finally abandoned the whole scheme as is so obvious from the title of his last book, The World of Life: A Manifestation of Creative Power, Directive Mind and Ultimate Purpose. (Wallace ). That does not mean that there need to have been supernatural intervention during the process of evolutionary change. Pierre Grasse properly identified the nature of the polarities that continue to inhibit our understanding of the evolutionary process. Ã¢â‚¬Å“Directed by all-powerful selection, chance becomes a sort of providence which, under the cover of atheism, is not named but which is secretly worshipped. We believe that there is no reason for being forced to choose between Ã¢â‚¬Å“either randomness or the supernatural,Ã¢â‚¬Â a choice into which the advocates of randomness in biology strive vainly to back their opponents. It is neither randomness nor supernatural power, but laws which govern living things; to determine these laws is the aim and goal of science, which should have the final say. (Grasse, page 107). Even Albert Einstein, who I donÃ¢â‚¬â„¢t believe ever commented on evolutionary matters, offered the following which certainly is not in any sense in conflict with what has been presented here. Professor Emeritus of Biology, University of Vermont, U.S.A.
Bailey, J.A., R. Baertsch, W.J. Kent, D. Haussler and E.E. Eichler . Hotspots of Mammalian Chromosome Evolution. Genome Biology 5: R23. Bauer, J.A., Y. Zou and W.E. Wright . Telomere Position Effect in Human Cells. Science 292: 2075-2077. Berg, L.S. , Nomogenesis or Evolution Determined by Law. M.I.T. Press, Cambridge. (original Russian edition, 1922). Davison, J.A. , Ontogeny, Phylogeny and the Origin of Biological Information. Rivista di Biologia / Biology Forum 93: 513-523. Davison, J.A. , Is Evolution Finished? Rivista di Biologia / Biology Forum 97: 111-116. Goldschmidt, R.B. , The Material Basis of Evolution. Yale University Press. Huxley, J. , Evolution: The Modern Synthesis. Harper, New York and London. Kortschak, R.D., G. Samuel, R. Saint and D.J. Miller , EST Analysis of the Cnidarian Acropora millepora Reveals Extensive Gene Loss and Rapid Sequence Divergence in the Model Invertebrates. Current Biology 13: 2190-2195. Schindewolf, O. , Basic Questions in Paleontology. The University of Chicago Press, Chicago and London. (original German edition, 1950). Yunis, J.J. and O. Prakash , The Origin of Man: A Chromosomal Pictorial Legacy. Science 215: 1525-1530. I propose that phylogeny took place in a manner similar to that of ontogeny by the derepression of preformed genomic information which was expressed through release from latency (derepression) by the restructuring of existing chromosomal information (position effects). Just a desperate “big idea” for funding and publicity which necessarily includes enough bogus obfuscation to brand those who oppose or even question it as “unscientific”. This theory, like all the others, has not and cannot be observed in process or tested; and so, for approbation it depends entirely on presuppostions and imagination. Design, on the other hand, is all observable; ID is based solely on observation in the light of known physical laws, mathematical proofs and common sense. – I have cordially invited everyone within cybershot to present THEIR versions of the MECHANISM of the greatest mystery in all of science, the production of a rational creature capable of asking such a provocative question. After over 400 posts I have recieved not a single response to that most important challenge. My formal conclusion is that I am the only person on this planet who has offered an explanation which recognizes everything we really know from the experimental laboratory, not to mention the undeniable testimony of the fossil record, none of which can ever be reconciled with the mythologies of Neo-Darwinism, neo-Lamarckism or Biblical Fundamentalism. My position is transparent and I am here to defend it. I do appreciate William Dembski and Dave Scott for allowing me, by joining with Micah Sparacio at ISCID’s “brainstorms,” to present my heresies here at “Uncommon Descent.” It is sign of an intellectual maturity not always evident on internet forums. Things are looking up or at least I like to think so. General George S. Patton. like myself, and Albert Einstein, a convinced determinist. Whatever happened to usurper? Nobody will know what I am talking about. Please reinstate usurper. What kind of a forum is this? I’m an old man and I can’t deal with this sort of thing. This hypothesis is very interesting to me. If I’m understanding it correctly, you are essentially positing a sort of front-loaded approach where instructions are hard-coded on the quantum level, telling species to abruptly appear at certain intervals? Am I somewhat correct? This approach would be consistent with a Theistic Evolution position as well as with Old Earth Pre-Ademic Race Creationists (I think). Fascinating stuff. Sure seems to explain what we have observed, far better than the Darwinian Narrative. Einstein was heavily, heavily in favor of a deterministic interpretation of the data. But he could only posit some sort of further layer that was beyond the scope of our instrumentation. Biologist and Nobel laureate Jacques Monod argues that chance and necessity alone suffice to account for every aspect of the universe. I find abhorrent the concept of chaos giving rise to amazing order on a higher level since it leaves everything meaningless. Because of this, personally I’ve leaned toward the deterministic view of quantum mechanics for a while but some of Dr. Dembski’s Intelligent Design arguments heavily rely on the probabilistic/indeterministic viewpoint (see chapter 20 of The Design Revolution). A deterministic viewpoint also has problems when it comes to the issue of free will. Despite my reservations, I accept the indeterministic viewpoint in relation to energy, time, and matter with the caveat that the underlying layer of determinacy is the mind. How would you define “free will”? Cosmological fine-tuning suggests that life was preplanned from the beginning of time (and space). Perhaps the entire history of life was preprogrammed in the information content of the first living cell. The big question would be, How did all this teleological, biological information get there, seeing as how the earth was once a big blob of molten goo? Perhaps the universe and living things were not only designed, perhaps the universe was rigged so that the mystery of life would remain an eternal enigma, so we would be compelled to look outside ourselves for answers to the big, and meaningful, questions in life. I sure can’t complain about anything presented here. I remain optimisic that all of both ontogeny and phylogeny will one day be revealed. Chemistry, Physics and Mathematics have already yielded many of their secrets. A model for the Prescribed Evolutionary Hypothesis (PEH) and one that profoundly influenced me was Godfrey Hardy’s insistence that all of Mathematics was there just waiting to be discovered. I have simply extended that perspective to include all of Chemistry and Physics and with that extension all of ontogeny and phylogeny as well. Living things are chemical machines and the secrets have to reside in the basic sciences somehow. When it comes to the sources of the information for both development and evolution I have wielded Occam’s Razor by making no more assumptions than are absolutely necessary. I see no reason to asume a personal God but I cannot avoid postulating one or more Gods in the distant past. My personal preference is that there were two Gods, one benevolent, one malevolent but I have not a shred of evidence for such a view except to say that it makes the behavior of man, the final product, much easier to understand. I also have never questioned Intelligent Design. Quite the contrary, I always regarded it as self-evident and a mandatory starting point from which to examine the two great mysteries of ontogeny and phylogeny which are simply two aspects of the same reproductive continuum. In my mind the most important aspect of this mystery resides in the realization that evolution is finished. Once that is accepted it immediately becomes clear why Darwinism cannot possibly have had anything to do with evolution, a process no longer in progress. Darwinism is a gigantic illusion based on the unwarranted assumption that evolution has and had an exogenous identifiable cause. Such a cause has never been identified and every attempt to simulate it has failed. I am convinced that all of both ontogeny and phylogeny resulted from internal forces which had absolutely nothing to do with the environment beyond its capacity to provide a suitable platform for both phenomena to take place. That milieu was and of course still is a fresh-water pond for the amphibian, a suitable temperature for the bird and the uterus for the mammal. I realize this may seem to be an extreme view to some but actually it is very conservative because it assumes nothing more than what is absolutely necessary. That is what science is all about. I seem to have overlooked Red reader. I have no theory Red. I have an hypothesis, one that is in concert with everything we are learning from chromosome physiology and molecular biology. Actually there is as yet no theory of evolution. All we have are thoroughly discredited hypotheses and a brand new one, the PEH. As a matter of fact in the forthcoming issue of Rivista di Biology you will find a paper by John A. Davison with the title “Do we have an evolutionary theory?” Be sure to read it. The word theory is one of the most abused words in the scentific lexicon. Theories sensu strictu are hypotheses that have received some degree of support. Darwinism doesn’t qualify. Sorry about that. Hi JAD, long time no see. I believe you are saying that evolution of species works similar to the growth of an individual organism. That is all the information needed to grow an adult vulture is contained in the fertilised egg. Likewise all the information for the bio-diversity we see today was contained in the very first living creatures. If so. Do you have any positive evidence of where this “evolutionary information” is/was held? I independently arrived at the gist of John’s hypothesis. I discovered his work a year ago while searching the web for others who’d arrived at tentative conclusions similar to my own. So far, John is the only one I found. I found Dembski the same way although he was a lot easier to locate and comes at the problem from a mathematician’s perspective instead of a comparative physiologist’s. Both I believe converge on the same general point – life, the universe, and everything is no accident. At any rate I found John while researching for myself the very question you ask – where could all this preprogrammed genomic information reside? One answer is suggested by the so-called C-Value Paradox. CVP is the situation where animals far simpler than ourselves have genomes many times larger. The social amoeba, a classic model organism for the colonial hypothesis of the emergence of multicelluar life from single-celled, has a genome some 200 times the size of our own. The common water lily has a genome scores of times the size of our own. Similarly many amphibian genomes dwarf ours. The complexity of the organism does not correlate well with the complexity of its genome and organisms exist with genomes tens and hundreds of times the size of our own. So that C-Value (c-value is the weight of the genome which roughly measures the number of base pairs in the DNA helix) paradox provides firm evidence that organisms can carry and flourish with exceedingly large amounts of genetic information that they (apparently) don’t utilize for any immediate fitness imperatives. This begs the question of how large would a genome be that can carry the basic irreducible information that can derepress into representatives of the major extinct and extant phyla. It seems to me a genome a couple hundred times the size of our own would do the trick. Additionally, since some 4 billion years have passed since this uber-genome in a universal common ancestor was required to fulfill the need you point out, it may today be fragmented and no longer available whole on the fresh food shelf, so to speak, for us to examine. Objections have been raised that non-coding (unexpressed) genomic information on such a scale could not possibly be preserved for any length of time as it would be subject to degradation through accumulation of random mutations. To this I answer that it is trivial to preserve large amounts of information intact through any number of replications. This is done in computer architecture (my expertise) all the time. I even hold a patent on an automated method of sensing an appropriate tradeoff between performance and data integrity in secondary CPU cache memory systems. Any number of error detection schemes could be implemented in a cell to preserve non-coding data integrity. Far, far more complex things are involved in the machinery of life than error detection on new copies of stored information. That’s a trivial obstacle to a designer wanting to preserve certain unexpressed genome data for the long haul. Another possible answer to your question is that the information is simply in the fabric of a deterministic universe – i.e. phylogenesis proceeded the way it did because there was no other way it could happen because it was all predetermined in the initial organization of the universe and immutable laws of physics were followed in the subsequent unfolding of it. I guess only the C-Value Paradox might be considered positive evidence of what you asked for and that’s tenuous. But hey, it’s not nearly as tenuous as basing all of evolution on random mutation & natural selection which has never been observed creating any novel cell type, tissue type, organ, or body plan. If you can buy into that without positive evidence you should have no problem at all buying anything else including bridges in Brooklyn, eh? And there is the possibility that when these large c-value genomes are sequenced and understood there we will find the definitive positive evidence you ask for. Yes, I think it is an accurate summary. I think most of the information was held in the nucleus. I am not at all certain about what happened to it over the millennia. I’m also not at all certain that life was created only once and neither should any one else. The origin of life was a miracle and miracles have a way of repeating themselves don’t you know. The universality of the genetic code may simply mean that is the simplest way to code for the twenty or so amino acids. The physicist George Gamov anticipated the triplet code as the simplest conceivable way to specify twenty different units. Nature had a way of doing things using the fewest possible devices. She was parsimonius or, if you prefer, stingy. One of the things I am interested in is the question of just how far we can proceed in establishing a common origin before we run into trouble. I am confident on the basis of chromosome homology that we can now say with some confidence that all primates are intimately related and that is not my conclusion alone by any means. In other words all primate species were produced by the reaarangement of a common informational substrate. I know of no compelling reason to believe that environmental influences played any role in that evolutionary radiation beyond acting as a releaser or, what I prefer to call, a derepressor of latent information. I certainly see no role for either allelic mutation or Natural Selection in those transformations. I also cannot imagine how obligatory sexual reproduction could have played a role either. That is what forced me to postulate the Semi-Meiotic Hypothesis (SMH) back in 1984, a position to which I still adhere. One of these days somebdy will test it. I was unable to find the suitable amphibian material and now I have no laboratory courtesy of the University of Vermont. It is best if someone else does it anyway as I am sure nobody would believe me if I were to create a new species by that means. I am confident that will one day be demonstrated under controlled conditions. A kind of evolution in reverse has already been achieved with yeast by simply reorganizing existing chromosomal information. My model for evolution has always been ontogeny where there is no role for the environment either. The important thing here is to realize that there is absolutely nothing in the Darwinian fairy tale that ever had anything to do with creative evoltion. It has always been nothing but an illusion based on the unwarranted assumption that every phenomenon has an external cause. Of course he was right about that also because when an amoeba divides to form two there is no corpse. It is only when we come to the higher life forms that mortality comes into play. It is interesting to note that within our bodies we have cells representing all three of the major protozoan classes, ciliated epithelia of the respiratory tract, amoeboid blood cells and flagellate spermatozoa. I don’t believe for a millisecond that those protozoa got together to produce higher life forms. Rather, we are now reading the same blueprints that those protozoans are still reading. That is pretty far out isn’t it? I certainly hope so. That is what makes science fun! What could be more pleasant than a vulture? Pretty ugly to be sure. But it does a dirty job, cleans up mess, helps prevent dissease yet gets little apreciation. A good representative of the downtrodden masses. Actually to be honest, I just wanted to use a different analogy to the Acorn-Oak tree. Just a desperate Ã¢â‚¬Å“big ideaÃ¢â‚¬Â for funding and publicity which necessarily includes enough bogus obfuscation to brand those who oppose or even question it as Ã¢â‚¬Å“unscientificÃ¢â‚¬Â. If I may, I would like to apologize to Dr. Davison for my ill considered and intemperate remark. It is obvious that Prof. Davison has put a lot of thought into his hypothesis. I hate to say it but it’s true: I engaged my opinion before I put my brain in gear. The question of genome size is interesting. Large genome size is associated with large cell size. Animals with large cells tend to be very sluggish related to the reduced surface to volume ratio assiciated with large cell volumes. My Doctoral work was on cell size and metabolism in frogs. The metabolic rate is directly related to the surface to volume ratio of the muscle cells. In other words metabolic rate is directly related to cell dimemssions which in turn are directly proportional to nuclear size and accordingly DNA volumes per cell. The smaller the cell the higher the metabolic rate. I was going to work with urodele amphibinas until I discovered that they have very low metabolic rates so I went to frogs which have a much larger range in adult size from little ones of 1 gram weight up to bullfrogs weighing a kilogram or more. The very low metabolic rates of the urodeles is related to their subterranean habit where oxygen tensions and amounts are very low. Another animal with very low metabolic rate and large cells is the lung fish which spends a lot of time in the mud. Metabolically active animals like mammals, birds and flying insects always have small cells and very low DNA content per cell as a result. So do actively swimming fishes. As nearly as I was able to determine the size of the genome was determined largely if not exclusively by the metabolic rate of the creatures involved. There may be more to it than that however. It is interesting though that urodele amphibians are very primitive non specialized creatures which in theory might be candidates for experimental evolution. In any event they have typical Mendelian inheritance which would indicate that their genomes are not present as multiple duplicates. Nearly every living thing today is so specialized that it is quite impossible for any of them to become anything very different. Robert Broom recognized this and I agree with him. Evolution, like ontogeny, thus seems to be self-limiting, irreversible and as nearly as I can determine no longer in progress. This latter seems to be where the establishment seems to take exception with me, although they have never said so in a refereed journal. That is why I have challenged anyone to take any two organisms and present the evidence that one of them is ancestral to the other. So far I have received no responses. Just as there are no intermediates in the extant flora and fauna I don’t believe there ever were any. All evolution was instantaneous, saltational and discrete producing products obviously different from their parent. I am convinced that we see the products of a long past evolution, not evolution in action as the Darwinians continue to assume and proclaim, oblivious to the fact it cannot be demonstrated. It really is a scandal which has finally become a hoax if you ask me. So don’t ask! If not the simplest at least the best one in a million for maximizing translation accuracy. I think you will find it is the simplest, no question about it. OK. I understand how quite a lot of the data *could* be explained by PHT, but how would you test the theory? If Evolution has stopped (an observation–in my opinion as an armchair theorist–that is consistent with ID theory: in other words, no “macro” evolution ever started or ever occured and therefore is now “stopped”), but anyway, if Evolution has stopped, how can we test whether PHT would occur if we could somehow rewind the clock? Correction: PEH not PHT in comment above. Thanks. “It is interesting to note that within our bodies we have cells representing all three of the major protozoan classes, ciliated epithelia of the respiratory tract, amoeboid blood cells and flagellate spermatozoa. I donÃ¢â‚¬â„¢t believe for a millisecond that those protozoa got together to produce higher life forms. Rather, we are now reading the same blueprints that those protozoans are still reading. That is pretty far out isnÃ¢â‚¬â„¢t it? I certainly hope so. That is what makes science fun! Very interesting. But does not a portugeuse man’o’war behave in a similar way? Lots of individual organisms acting in a manner that appears to be a single organism? Would it not be possible in say 2Million years for the Man’o’war to become a single creature? I have a few questions regarding the hypothesis, I have only learned of it form this thread, so apologies if any of the questions are discussed in any of the papers mentioned. Does the PEH infer that the major phenotypic differences between, the human and chimpanzee for example, are caused by the chromosome rearrangements, as opposed to mutations in promoter sequences and transcription factors affecting gene expression? Isn’t it likely that the majority of these rearrangements will lead to death, and only a few will increase fitness or be neutral? Why can’t chromosomal rearrangement be the product of Darwinian evolution if some produce increased fitness and are selectable? In many cases evolution involved the loss rather that the gain of genetic information, or at least the loss of genes. Why is this a problem for Darwinian evolution? When plants are observed producing fertile offspring with novel chromosomal morphology, is this the result of prescribed evolution? This question may be missing the point, but if the PEH accounts for gaps in the fossil record, does this mean that a member of one species gives birth to another? If so, doesn’t this put a severe limit on the differences that can occur during each change, and would it predict how large the gaps are likely to be? If the ‘path’ of evolution was pre-planned at the start of life, wouldn’t random mutation, HGT, duplication etc mean that eventually the process would not be able to function because there would be no way to predict the effects of the chromosomal rearrangements? Chromosome rearrangements are not random. Read my paper and the references. There has never been anything random about evolution any more than there is now in the development of a unique human being from a single cell. I don’t know how many times I have to say this but chance never had anything to do with either evolution or development. Got that? Write that down. Several human studies indicate that women may mate for genetic diversity on the basis of subtle odor cues (e.g., pheromones). The mechanisms behind this type of choice remain to be detailed, yet are expected to be largely chemosensory/olfactory, as they are in other mammals. Of interest to others may be a forthcoming report that a synthetic human pheromone (male) (progesteronic) decreases luteinizing hormone/follicle stimulating hormone pulsatility in men, and a recent presentation detailing an increase in men’s testosterone upon exposure to the synthesized ovulatory pheromones of women.